There’s only a few days to go until we launch the first segment of healthtalks and so it’s probably time I stopped teasing you right? Since we first mentioned our plans a few weeks back, on all of our blogs and on the Facebook page, there’s been a lot of speculation and comment from many of you about where we might be seen, which Channel we might be on and at what time? Well, the fact is that we’re not launching on TV – although who knows, we may finish up there! All of our material will be available right here, online – but in a really special way. For many of you, a regular visit to one or more of our blogs is already a part of your routine. So that’s where our segments will appear, right there on the blogs – all 4 of our blogs on the same day. This hopefully means that not only do we reach more people with our interesting topics and great ideas but we also get feedback from viewers with diverse points of view. Each of our healthtalks hosts is a Health and Wellness expert and we figure that by combining our knowledge and energy, we’re going to be able to explore areas that this type of discussion has never been to before. We have a list of great topics and tips lined up that we KNOW you’re going to love. But as we’ve already mentioned, a big part of healthtalks are the comments and feedback that come from YOU. We want to hear what you think, whether you write a single line or half a page. And your thoughts and ideas will help us drive healthtalks in the direction you want us to go in too. 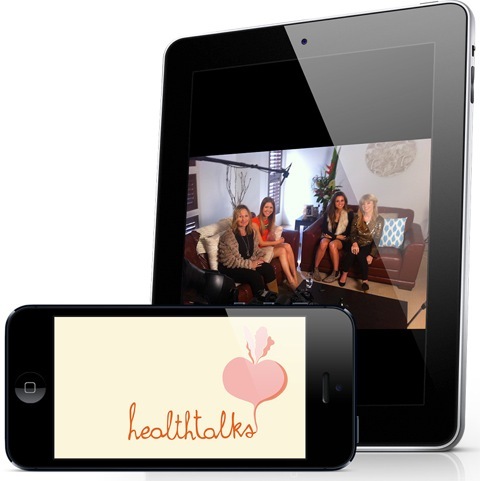 So, you can watch healthtalks on your computer, your mobile phone or your tablet and you’ll never have to get home at a set time or have to program the VCR to see us. Each new segment will be on the blogs for a whole week and then it’ll be available elsewhere as well, once we get rolling. Our first series of six segments starts with our intro segment this Friday. Then from Tuesday October 16th and every Tuesday from there on, we’ll be there first thing in the morning with a fresh topic to discuss, or a bunch of ideas for you to try out. So – that’s it. What do you think? Sam – Food. Health. Wealth. Oh and one more thing – see the little screen in my side bar, across there to your right? That’s where you can always find the latest healthtalks clip – if you haven’t seen the sizzler, go up there now and check it out! It’s good practice for the weeks ahead. LOVE how fresh you ladies all look! This is a very cool idea!